Get this fun graphic on gifts & gear Here. If you can find the blue Maraschino cherries it really pulls the whole look together. I found mine at the grocery store in the booze aisle believe it or not - they were raspberry flavored. People really get excited over blue cherries for some reason, lol. I am finally putting together the full website for The Martini Diva and it's a huge undertaking - with nearly 300 recipes (and growing) I have a big job going. It's going to be a really great martini website though - each recipe will have it's own page with the free recipe card for you to download, plus any information on that martini, I will also have several ways to search for martinis, martini tips and articles, jokes, quotes, drinking games and all sorts of fun. But. . . .I discovered I had very few tequila martinis! Something I am going to have to address once the website is up and running. I prefer vodka myself so I have a ton of those as well as a good number of rum martinis but I have neglected the tequila martinis! 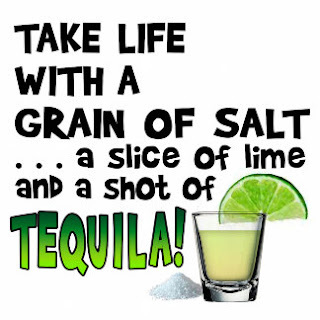 I have to get more tequila and get to work!